This collection was transferred from the Law School on January 3, 1968. The loose correspondence was salvaged from a flood in the mechanical rooms of the Biddle Law Library and transferred on February 13, 1991. The collection was reprocessed in April, 1991. The William Draper Lewis Papers are organized into four series: Correspondence, Legal, Manuscripts/Writings, Lectures, and Speeches. The Correspondence series is arranged chronologically and the other series alphabetically. William Draper Lewis was born in Philadelphia in 1867, the son of Henry and Fannie Hannah Wilson Lewis. He attended the Germantown Academy and then Haverford College, receiving a B.S. in 1888. In 1891 he graduated from the University of Pennsylvania with a LL.B. and Ph.D. During his student years, Lewis lectured at Haverford College on economics and at the University of Pennsylvania’s Wharton School on legal historical institutions. In 1892 he became editor of the American Law Register, one of the oldest legal periodicals of the time. He resigned these posts in 1896 when appointed Professor of law and Dean of the Law School. As the Dean of the Law School he worked at expanding the school and in 1900 the present building on the Penn campus was erected. Aside from physical plant improvements, he advocated for the appointment of full-time law teacher dedicated to instruction and scholarly contributions; he persuaded the publishers of the American Law Register to turn over the magazine to the University; he broadened the curriculum of the Law School; and he strengthened the collections of the Biddle Law Library. Ultimately these revolutionary academic, organizational, and physical facility improvements brought the Law School into the first rank of legal institutions in the United States. He served as Dean until 1914 but continued on the faculty until 1924 when the pressure of his work as director of the American Law Institute forced him to resign. In addition to his advances in academia, Lewis made significant contributions to the field of law. In 1923 he was elected as the first chairman of the Penal Reform Society of Pennsylvania. He authored many articles, some of which include: “Federal Power over Commerce and Its Effects on State Action,” Our Sheep and the Tariff,” and “Restraint and Infringement of Incorporated Rights.” He edited many works among them his own editions of “Greenleaf’s Evidence,” “Wharton’s Criminal Law,” and “Blackstone’s Commentaries.” Lewis, the founding director of the American Law Institute, worked at publishing restatements of the common law which would serve as the authoritative compendium of the American Law as it then existed. He served as director until ill health forced his retirement in 1947. He had become highly involved with the Progressive Party by 1912, unsuccessfully running for the Governorship of Pennsylvania. He served as the chairman of the platform committee of the first and second Progressive National Conventions in Chicago in 1912 and 1916. 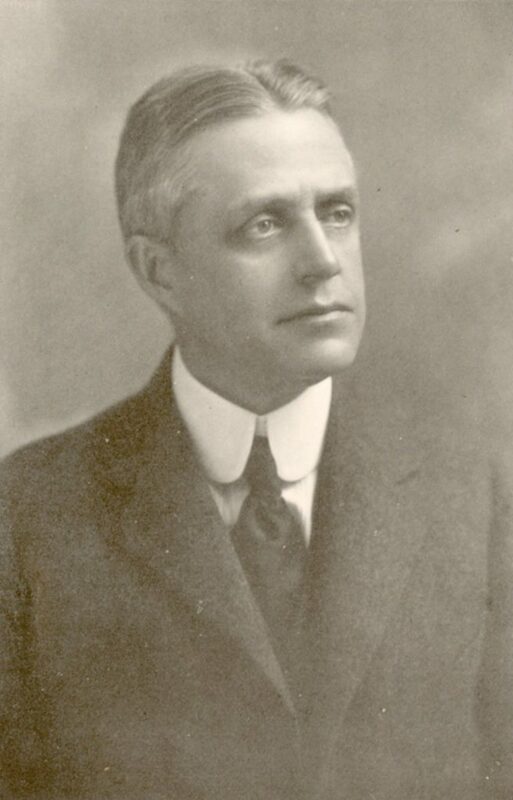 His liberal political attitudes were recognized in 1918 with his appointment as the chair of the commission to draft a Public Utility Regulation Law for Pennsylvania. He also served as secretary of the commission appointed in 1920 to draft a revised State Constitution. Lewis died in 1949. This collection is particularly rich for researchers interested in the early career of William Draper Lewis. His association with the University of Pennsylvania is well documented. There is very little, however, for his later years and virtually nothing on his involvement in Progressive politics or the organization of the American Law Institute. Loose correspondence and letterpress books make up the bulk of the collection. His correspondence is largely professional in nature, but there is a good sampling of personal correspondence. The personal letters cover a range of topics including: fund raising for Haverford College, family letters, renting property in Bar Harbor ME, and other personal matters. His professional correspondence address his teaching and administrative career with the University of Pennsylvania and legal correspondence regarding particular cases. His scholarly contributions and publications are discussed in his letters. Correspondence with George Wharton Pepper proliferates. In addition to being close friends the two edited the Digest of Decisions together. There are many letters from George E. Nitzsche, the Registrar for the Law School, and later Recorder for the University. Five cases constitute the legal files. They include: Smallberger v. Pennsylvania Railroad, United Gas Improvement Co. v. Northwestern Ice Manufacturing Co., Anselmo Susanich, Hollis v. Brown, and the Philadelphia Election Case. There are letters, decrees, rulings, plaintiff’s and appellant’s points, receipts, accounts, statements, affidavits, briefs, notes, motions, arguments, and other miscellaneous paperwork associated with the legal work. There is a small group of manuscripts; the titles of which include: “The Borderlands of Federal and State Legislation,” Cases on Law of Association, Cases on Specific Performance, “Fallacies of Free Trade,” “How an American City Can Become a Modern Municipality,” “On Free Trade,” “On Fundamental Ideas,” “Our Sheep and the Tariff,” and “The Principles of the Two Great Parties.” There are also lecture notes on all phases of law and government. Finally, there are a few speeches delivered from 1895 until 1946.